We apologize for the long delay in the Breakdown. The breakdown will now be released weekly!! Please check upcoming events below and the schedules for Youth K-8 and High School. The competitive season has started for youth and begins Saturday for the #4 team in the state!! Friday was our annual Navy/Gray Scrimmage and Alumni Night. We had a record 46 wrestling alumni (wrestlers and managers) show up and be honored! 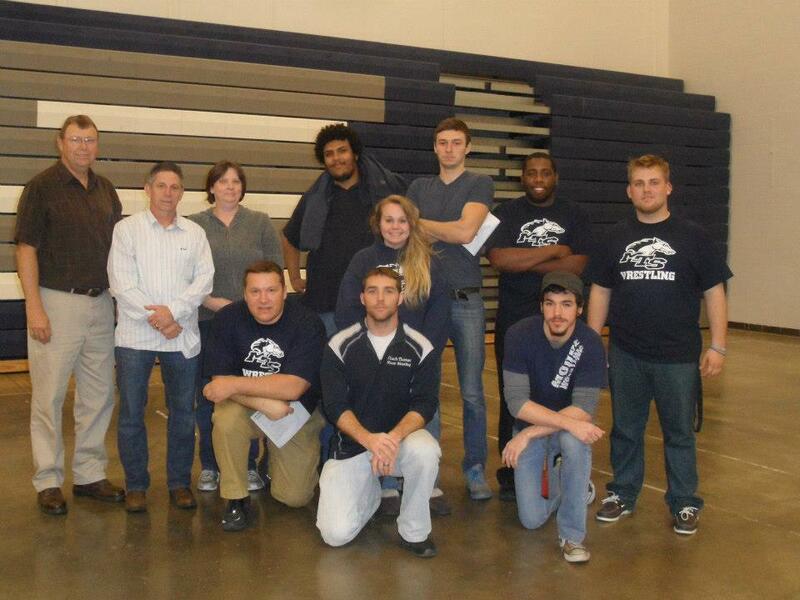 Alumni met in the wrestling room to see the room updated in 2005. Many of these alumni did not have a wrestling room. From there they received their honorary Moore Wrestling Alumni shirts and made their way up to the lobby for a huge group picture. 3 matches into the scrimmage Coach Thomas (class of 98) introduced all alumni spanning from 1973-2013 as they lined up all the way across the gym floor. Unfortunately former Coach Bill Mosby was unable to attend but will definitely be around this season to catch some matches. It was a great night with lots of alumni catching up and having a good time watching the current Moore Wrestlers perform. Thanks for coming!! 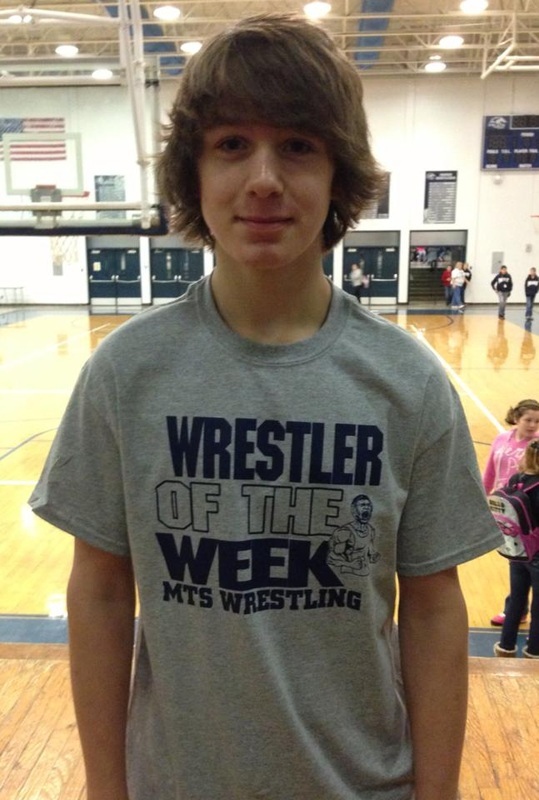 Nov. 11th - 15th - High School Wrestler of the Week! 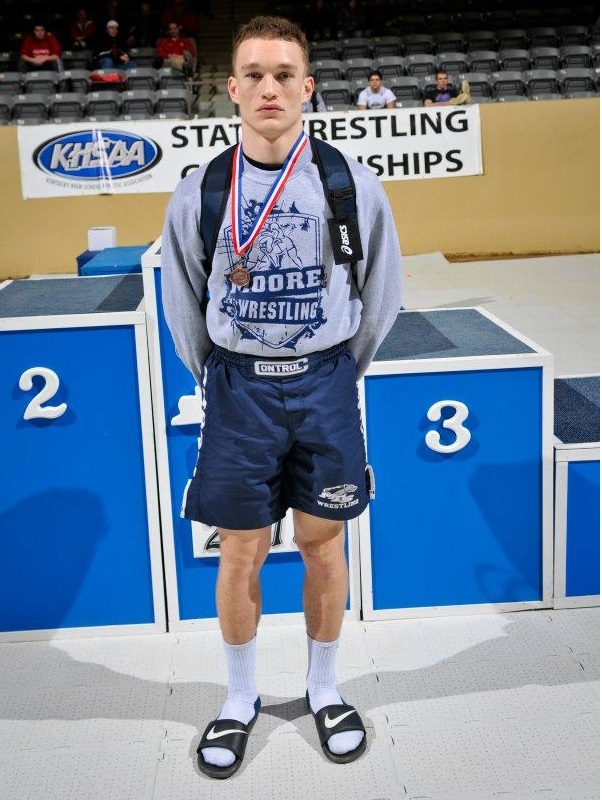 Congratulations to sophomore Seth Pitts for earning Wrestle of the Week honors for the week of Nov. 11th - Nov. 15th. Seth made the A, B honor roll 1st tri-mester and works very hard in practice everyday. 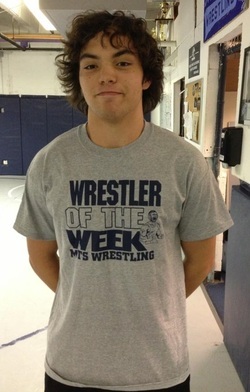 Another wrestler of the week for Nov. 18th-Nov. 22nd will be selected Tuesday. Coach talks to team after win over X in 2012. 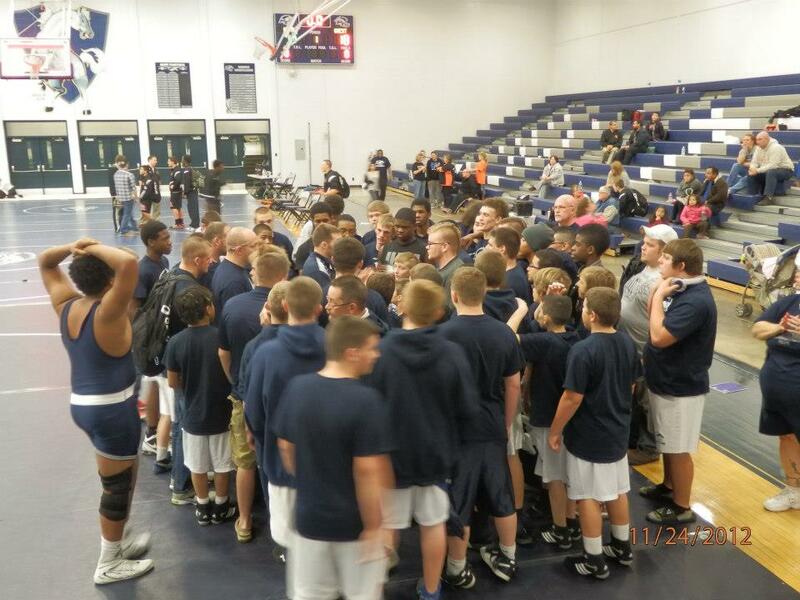 Moore will host their annual Big Brother Duals Saturday Nov. 30th. Wrestling starts at 9:30am. The Big Brother format entire organizations head to head in a dual format. ex. 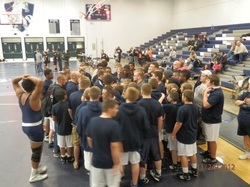 Moore Middle will wrestle North Hardin middle then Moore High will wrestle North Hardin high. The scores of the duals will be combined into one score and then the team with the best record at the end of the duals will be the Big Brother Duals Champion. Moore will compete against Fern Creek, North Hardin, Scott High, St. X and the middle school team will compete against their feeder programs. The event will conclude with #4 Moore against #3 St. X. Moore has won the dual the last two years in a row at Big Brother and has defeated St. X 2 out of the last 3 times they have face. Don't miss this one!! check the Facebook event page HERE!! Justin McDaniel finishing a take-down. 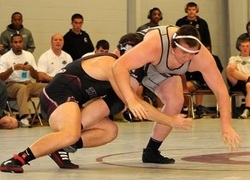 Justin McDaniel (2013) is currently ranked #14 in the nation on Intermat.com's NAIA rankings for heavyweight wrestlers. 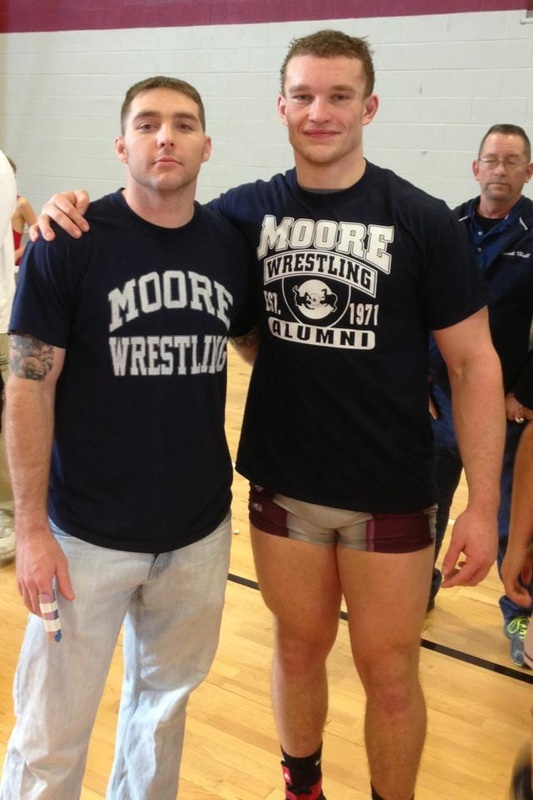 Justin went 2-2 this past Saturday as we made the trip to Campbellsville to watch him wrestle. His current record is 12-5. Justin could not make it Friday night to alumni night so we delivered him his shirt and he put it on for a nice pic after his last match.